The main differences between traditional thermostats and smart thermostat. The different features available for each type of thermostat. How to choose a thermostat that’s right for your home. The best wi-fi and programmable thermostats on the market. We include our top two picks, a budget option, the best thermostat for large homes, and some notable runner-ups. 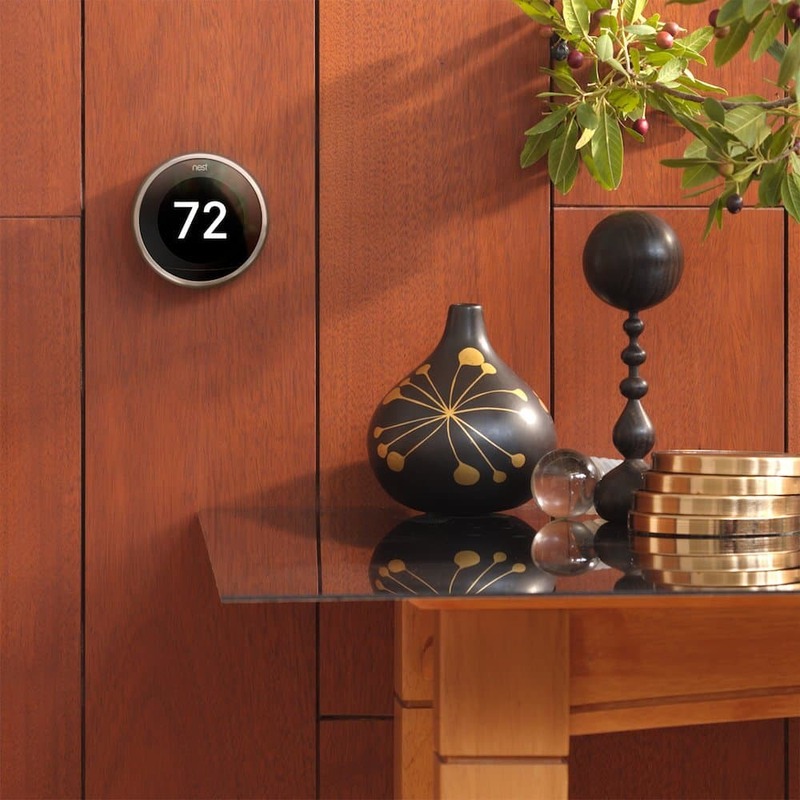 Nest made the original smart thermostat and has continued to make the best models ever since. With the most advanced energy saving savings capabilities, reporting, and integrations it’s hard to go wrong with a Nest smart thermostat. Their website and mobile apps are easy to use and the thermostat is easy to install. We also think they’re the best looking thermostat on the market and look great no matter how you’ve decorated your home. In most cases, there are big benefits to upgrading your thermostats – they’re convenient and can save you money, they often pay for themselves over the course of a few months. Traditional thermostats only allow you to adjust the temperature in your home. On the other hand, programmable thermostats allow you to set up a schedule and have the thermostat change the temperature based on the schedule. And the most advanced smart thermostats take this one step further to learn the preferences of their users and set the temperature based on past usage. 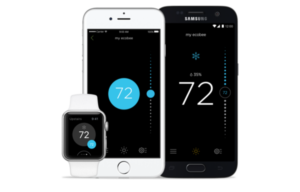 Smart thermostats can also be controlled remotely, show energy reports, and adjust their properties based on the conditions outside. How does this save you money? By programming your thermostat properly, it will know when to run and when to turn off. By reducing any unnecessary heating/cooling going on. Heating and cooling systems account for nearly 50% of the average home’s electricity bill according to the department of energy, so any reduction is usage can add up to big savings on your monthly utility bills. After determining the type of HVAC system you have, you should think about what you want out of your new thermostat. This will help you narrow down your options and understand what you’re willing to spend on your new smart device. If you spend most of your time at home, then you could go with the basic thermostats that do not have to be programmed at all. But, if you are away often or if you have a regular schedule, then more complex models could suit you. Some programmable thermostats allow you to set different schedules for the weekend and for the work days. Others allow you to set up four different temperatures for each day of the week. The most advanced learning thermostats do not need any programming at all. Instead, such thermostats focus on “learning” your schedule. The main advantages of a programmable thermostat are their convenience and cost savings. You can always program your thermostat to run minimally while you’re away and to warm up/cool down slightly before you come home. This will save you money and you will return to a comfortable environment. On the other hand, smart thermostats can do everything mentioned above and even more. They have more features and they are easier to integrate into your daily life. You can control your thermostat remotely, which comes in handy if you have irregular hours. Let’s say your system is programmed to start heating up your home minutes before you return from work and maintain a comfortable temperature over the weekend. What if you have to decided to go away for the weekend? You don’t want to heat an empty home. 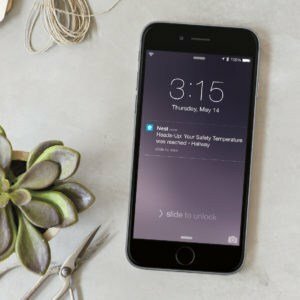 With a wi-fi enabled thermostat you can update your settings on the go, there’s one less thing to remember as you’re walking out the door. Remote access is also incredibly useful if you are installing the thermostat in a vacation home. You could turn the heat or air conditioning on a few hours before your arrival to make sure your home is comfortable by the time you get there. This is also great for those who rent their homes on AirBnB or VRBO – you can make sure your guests are comfortable when they arrive and ensure the HVAC system is turned off after they leave. Digital assistants have taken the world by storm. Amazon has sold nearly 20 million Echo devices, with millions of Americans asking “Alexa” to run their homes. Google has followed suit with the introduction of their own Google Home devices. Apple has recently launched the HomePod to bring Siri into the home as well. If you have other smart home devices you should consider buying a thermostat that works with your existing system. Many thermostats, such as those produced by Nest, can be integrated with Amazon Alexa. Alexa constantly keeps getting upgrades. She was capable of voice interaction, playing music, making to-do lists, providing weather information and news. Now she can help you control the temperature in your home. You can use Amazon Alexa to find out the temperature in your home, set target temperature, and increase/decrease the target temperature. Currently, Alexa is compatible with Nest learning thermostats, Honeywell Lyric & Total Connect Comfort thermostats, Ecobee4, and the Sensi Smart Thermostat. 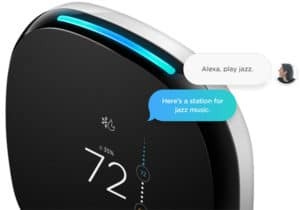 Besides Alexa, many smart thermostats work with other smart-home hubs like Wink, SmartThings, and Apple HomeKit. 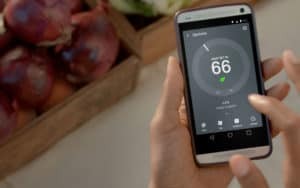 Nest also developed their program Works with Nest which connects the user’s thermostat with many other products such as lights, garage door openers, cars, and many more. For example, a Nest thermostat can turn up the heat when the user activates Chamberlain MyQ garage door opener and signals they’ve arrived at home. If these advanced features are something you would like your thermostat to have, then make sure to check its compatibility with smart-home systems. Smart thermostats can also monitor energy consumption and even provide reporting on how much energy you’re using, how much you’ve saved by installing the thermostat, and even the health of your HVAC system. These reports are accessible online or via a smart phone app. In some cases, these reports can provide further recommendations on how to configure your thermostat to help lower your bills. 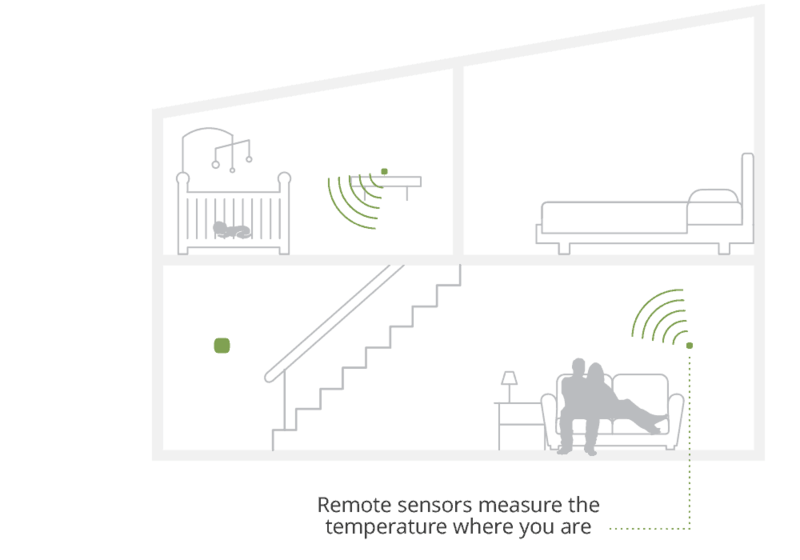 Some of the latest thermostats come with wireless remote sensors. These sensors address one important flaw that has been around for decades. Typical thermostats measures the temperature of the room it is located in. This is often why there are “hot rooms” in a home even when the air is on. Homeowners must deal with the inconsistent temperature, or crank up their system to get the dead zone up to a comfortable temperature while wasting energy everywhere else. Wireless remote sensors can help resolve this issue. They measure temperature in several rooms and allow you to set the temperature for individual zones, helping your thermostat regulate temperature in your house more consistently. Wi-fi and programmable thermostats have one common concern. As buyers compare the best WiFi thermostats the most important thing to consider is if it will be compatible with their HVAC system. There is a lot more to buying a new learning thermostat than choosing a brand or finding the best looking model. There are various types of heating and cooling systems and you should make sure that your new thermostat works with yours. Most common HVAC systems are one- and two-stage systems. Usually, thermostats support only one heating and one cooling system with multiple stages. However, some can have up to four heating and three cooling functions. For example, if your system has baseboard heat, a hot air system, and air conditioning, then you have a “two heat” “one cool” system. Nowadays, central heating and cooling systems are the most common ones. They can be electric, gas, oil or 24V. If you are not sure which one you have, check your furnace. Electric systems usually do not have any glass windows, unlike gas furnaces which have a small window and a visible blue flame inside. Another consideration is whether or not your system has a “C-Wire”. We explain what a C-wire is here, but basically it determines how you provide power to your thermostat. Unlike other thermostats, most wi-fi or programmable thermostats require a C-wire. Whether or not your HVAC system features a C-wire will determine which thermostats can control your system. There are ways to install a smart thermostat without a C-wire, but it will take a bit of extra effort during installation which is worth considering. There are many tutorials on how to install a C-wire by yourself or you can always hire an electrician to do it for you. The Nest 3rd generation learning thermostat win you over right away with its sleek and futuristic design. Nest invented the original smart thermostat and changed the way we look at this basic home appliance forever. 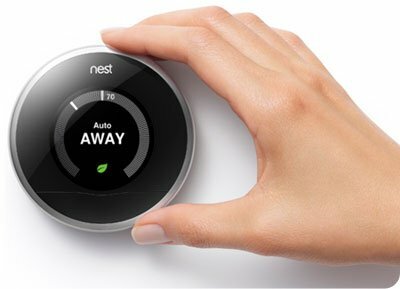 Since the introduction of their first model Nest continues to refine their top of the line thermostat and push the original features even further. The thermostat has a puck-shaped design and it is available with white, black, copper or stainless steel finish. The 2.1-inch display has 480 by 480 resolution. It is very easy to enter information – Nest spent a lot of time in the design phase and wanted to make sure the thermostat was easy to use. Just press the edge of the ring to launch the menu, turn the ring to find the desired setting and press the ring to select a certain item. What sets this Nest thermostat apart from other thermostats is its smart Auto-Schedule feature. Nest has invested a lot of time into this feature to help reduce energy costs for its customers and consistently publishes studies based on their results. 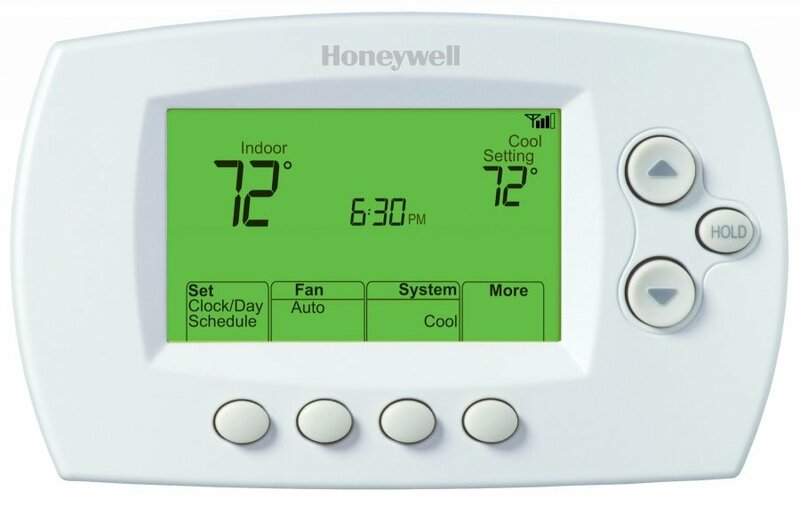 Auto-Schedule allows the thermostat to learn the user’s daily heating or cooling preferences. After only one week of use, Nest 3rd gen thermostat will automatically create a schedule based on the user’s preferences. Of course, you can always set up a manual schedule whenever you need it. Another smart feature of Nest 3rd Gen Thermostat is its proximity sensor. It detects people when they walk by and immediately lights up the screen to display the current temperature in the room and the temperature it is set to currently. This sensor also helps notify the system if someone is home outside of the determined schedule. 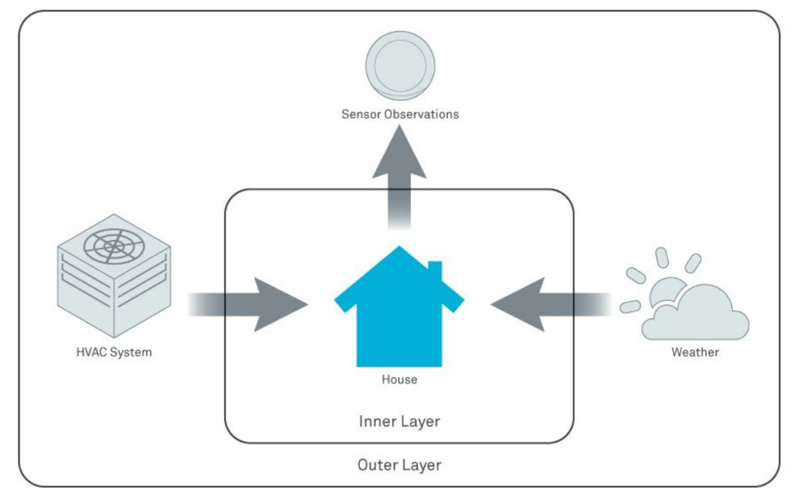 It can use this sensor to determine if someone is home and modify the temperature in the home. The Nest 3rd generation thermostat can also control your hot water heater as well. The thermostat can trigger the hot water heater’s activity based on this motion sensor. This avoids heating up water when the home is empty and can help save money on your gas or electric bill every month. The thermostat has a 1-degree temperature swing, meaning that it will only activate your HVAC if your home is more than 1-degree warmer/cooler than your target temperature. This makes the thermostat more energy efficient than its competitors. This is one of many features that can help the Nest owners save some energy and reduce his bills. The built-in sensors can track humidity, temperature, movement, as well as outside conditions. If the conditions are right, this Nest Learning Thermostat will automatically shut off the user’s AC compressor early and leave the fan running. By doing so, the leftover cold air will cool the user’s home for a while and this can cut cooling costs by 30 percent. The thermostat uses its motion sensors to determine if anyone is at home. if the home is empty, the thermostat will automatically switch to Auto-Away mode. It can also detect the user’s smartphone location and activate the HVAC system when the user comes within a few miles of his house. 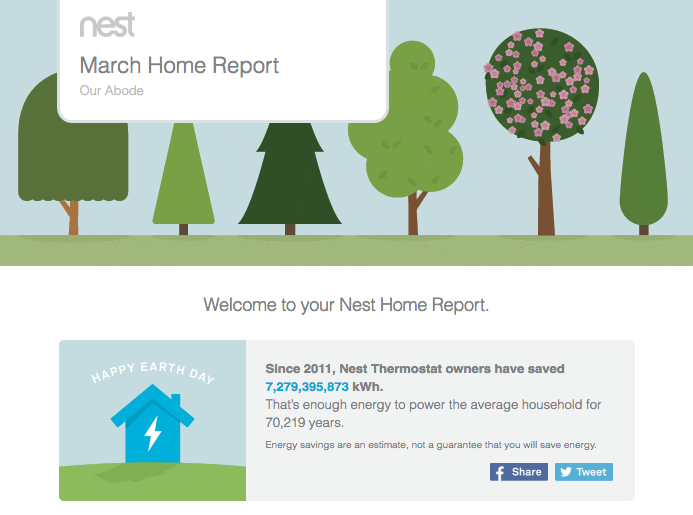 Monthly Nest Home Reports are provided to every buyer. They show you the energy consumption for the last month and also give some tips on saving even more energy. 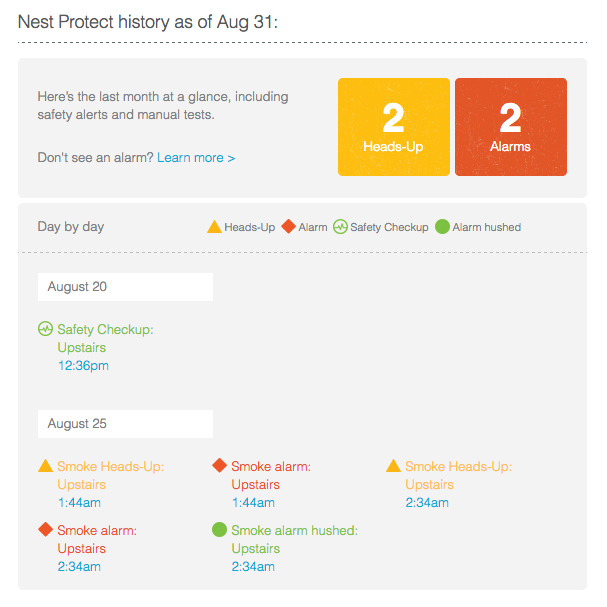 A feature that adds to the amazing performance of Nest 3rd generation thermostat is the Safety Alerts feature. This Nest thermostat is so smart that it will text its owner whenever it detects something odd about the HVAC system. For example, if the temperature outside is so cold that your pipes could burst, Nest will alert you so that you can take action. Don’t worry if you are not at home when something comes up because you can always control this thermostat remotely thanks to the Nest app that is compatible with the thermostat. In addition, this advanced thermostat works with many other Nest devices, such as Nest Protect smoke detector and Nest security cameras. With multiple Nest devices you can see an detailed overview of your entire house in the monthly Home Reports. Nest integrates with a number of third-party devices as well, like Haiku fans, LIFX lighting, Wink Hub, and many more. The users can easily control the thermostat by using Google Home or Amazon Alexa. To learn more about the Nest 3rd Generation thermostat check out our deep dive review. The Ecobee4 is a smart thermostat and the best choice for those who live in a big house. It excels where many other advanced thermostats fail – providing a comfortable temperature in all rooms. Most thermostats only monitor the temperature in the room they are placed in. 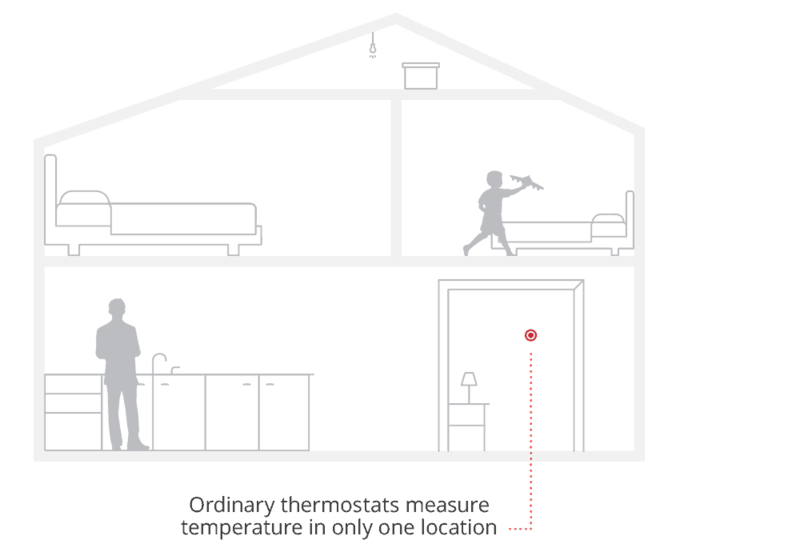 Ecobee4 uses remote sensors that can measure the temperature in other rooms as well. The sensors send information to the main unit which then makes sure to provide the desired temperature in all of the rooms across the house. In addition, motion sensors help the unit to determine whether anyone is at home or away. If a particular room is empty the system will adjust the temperature by itself to save energy. Ecobee4 provides the user hands-free control and features many smart home integrations. It constantly monitors the temperature inside, as well as weather conditions outside, and adjusts the HVAC system accordingly. With its advanced features and remote sensors the Ecobee4 is surprisingly user-friendly. 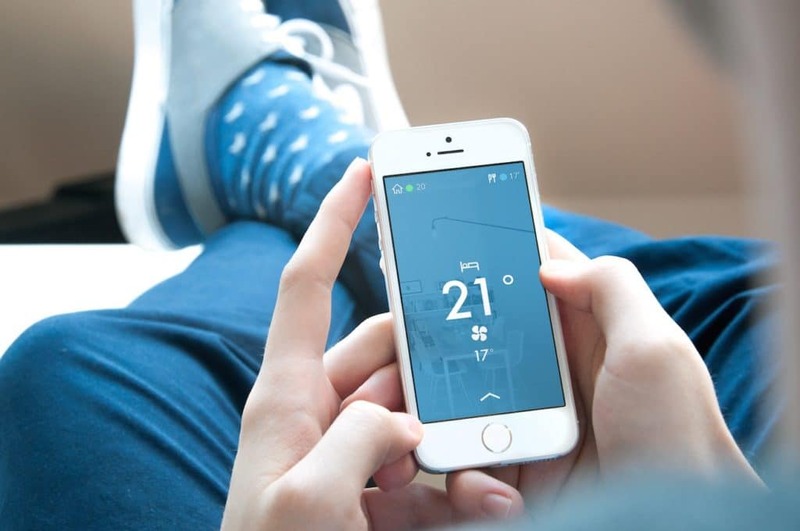 That easy-to-use design carries through to the smart phone app, making it is easy to adjustment your heating and cooling settings on any device. The Ecobee4 comes with many smart features that make sure that your home temperature is optimal but also that you save some money. With the ability to control multiple types of devices, the Ecobee4 gives users much more control over temperature and humidity in the home. For example, if your home has a whole house ventilator, the unit will use outdoor air to cool your home when necessary. The Ecobee4 can also regulate indoor humidity by using air conditioning system or a humidifier. One of the most advanced features that this thermostat has is the Smart Recovery. This feature monitors the temperature outdoors and searches for the energy-efficient way to regulate your home temperature. It uses every device under it’s control to maintain the desired temperature while minimizing the running time of the HVAC system as much as possible. This reduces wear and tear on your system, cuts energy usage, and helps save you money in the short and long term. This thermostat has more advanced motion detecting abilities than Nest and Honeywell models. As already mentioned, the Ecobee4 comes with remote sensors that detect activity and temperature in the rooms they are placed in. This prevents your system from switching to “away” mode because of the motion sensors is located in an area you do not spend much time in. For example, if you were in your bedroom, but your thermostat was in your living room, the Nest or Honeywell models might thing you left the house. With Ecobee4’s remote sensors this would not be an issue. Instead, the thermostat would adjust the temperature in your living room and bedroom to match your preferences. The kit comes with only one sensor, but you can always purchase additional ones. The sensors can be hung on the wall or placed on the included stand. The sensors run on batteries, are portable, and very easy to install. The Ecobee4 has advanced energy reports called Home IQ which can be accessed through the web. Home IQ has two main features. Runtime Reports gives the user an estimate of how much energy they used and how much money they have saved. 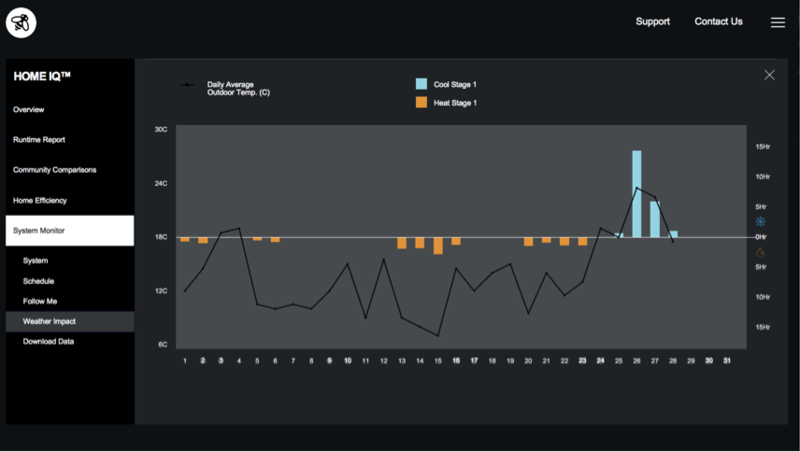 Weather Impact shows the user how the weather and the outside temperature impact the total run time of the HVAC system. Home IQ can save up to 18 months of data. 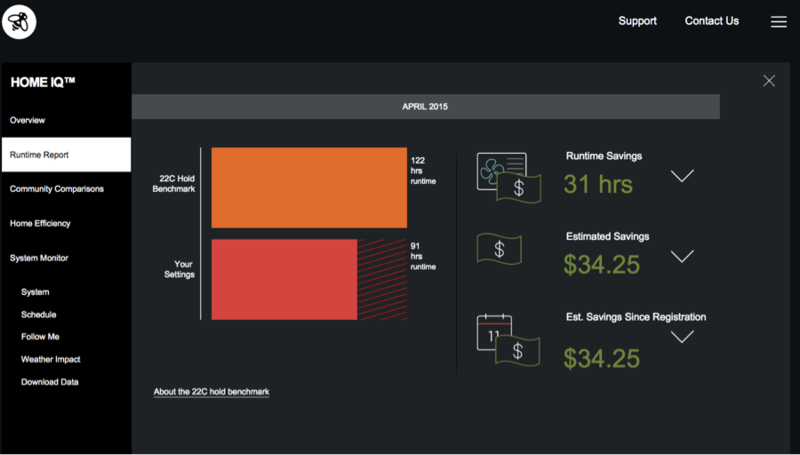 This is great because you can analyze your systems usage and performance over the long term, identify trends, and understand the health of your HVAC system. 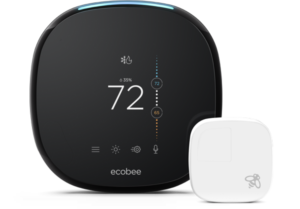 If you’re interested in learning more about the Ecobee4 we recommend you check out our guide to the best thermostats with remote sensors. The Honeywell RTH9580WF programmable thermostat is very pleasing to look at and can fit in any décor. The large touch screen displays all the information you need – current temperature and humidity, HVAC’s operating mode, and the target temperature. This thermostat from Honeywell is very easy to setup and use. You can control it directly from the control screen or via an app that can be downloaded to your PC or Apple/Android smartphone. One of the very important features is the possibility to manually override the set-up schedule. If your schedule changes, just adjust the system manually for a certain number of hours without disrupting the predetermined schedule and settings. It is important to mention that this thermostat is also a smart thermostat which can help you save a lot of money by learning your heating and cooling patterns. Here are some of the Honeywell RTH9850WF’s best features. The remote companion app that is compatible with Honeywell RTH9580WF is free and will give the user full control over their thermostat. With the thermostat connected to wi-fi, the user will always be in control of the temperature in their home regardless of their location. The thermostat will also regularly notify the user about important changes in temperature, humidity or about certain errors that may come up. Honeywell users say the companion app that comes with this thermostat is the best one there is and is incredibly easy to use. The Honeywell RTH9580wf is a programmable thermostat that is also a learning thermostat. It does not learn as fast as Nest 3rd generation thermostat does, so it takes a bit longer to gain some of the monthly savings. This thermostat comes with Smart Response feature, which is actually an internal system that analyzes how the user programs the thermostat over time. After some time, the device will start adjusting the temperature by itself to match the ones its user typically chooses. In addition, the thermostat also gathers outdoor weather conditions from Accuweather. It uses this information to predict temperature changes and heat or cool the house accordingly. The RTH9580WF can be programmed directly or using the mobile app. By creating a schedule and adjusting your HVAC system you can reduce your energy usage to save some money. Creating a schedule is easy. You can do it yourself or have the app do it for you after answering some questions.You have the option to edit your schedule at any time. The RTH9580WF can also determine peak hours on its own by automatically gathering records from local utility companies. It uses this information to reduce energy use during peak hours and help you save even more energy and money. In areas where that are susceptible to energy black outs, thermostats like this one can actually help the entire community avoid power outages. If you want to learn more please check out our deep dive review of the Honeywell RTH9580. 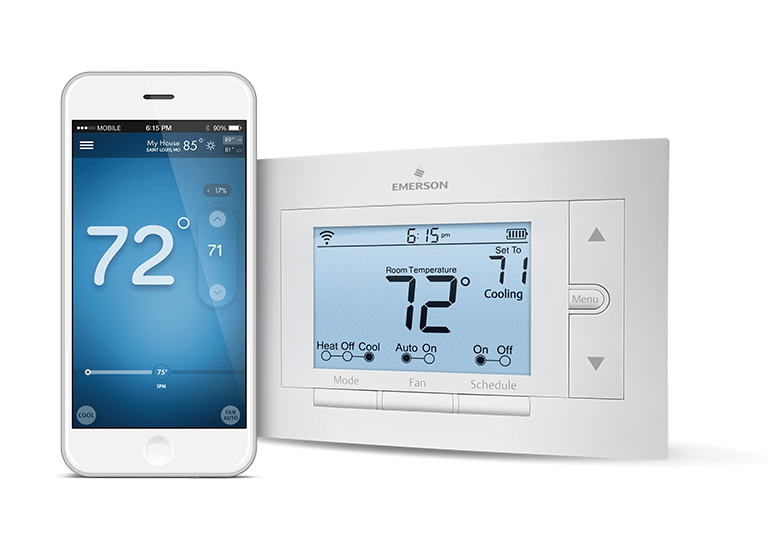 The Emerson Sensi is a feature-packed smart thermostat for way less than its competitors. You can check the price here on Amazon. It has an easy to use interface and well-designed app. It is a very simple thermostat that still manages to be a smart upgrade compared to the traditional model. As you would expect this thermostat is not as advanced as the two previous ones. First, it looks more like a traditional thermostat and does not feature a touch screen. It does not have any remote sensors. It will not learn your preferred temperatures. It doesn’t integrate with every smart home device under the sun. So, why should you buy it? For one, it’s well priced. Emerson Sensi is not the most advanced thermostat but it is the best one you can get for that money. No, it does not have automatic temperature scheduling nor motion sensors, but it is programmable. With right scheduling you can still save a substantial amount of money every month on your energy bills. 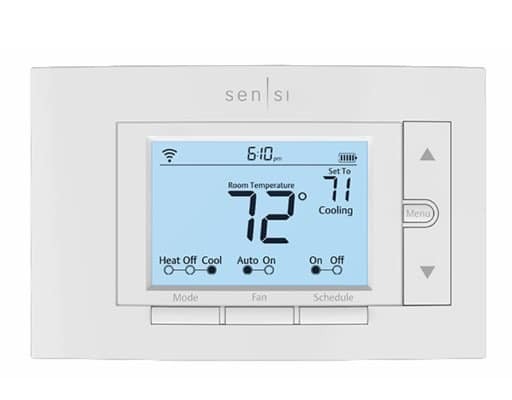 Unlike many other programmable thermostats the Sensi supports four-stage heating. Its options also include two-stage cooling. The unit comes with seven-day scheduling option, humidity sensor, geofencing, weather information, and away settings. It’s lightyears ahead of your traditional thermostat. The Sensi can also be controlled from anywhere with an app that is compatible with Android and iOS smartphones. This is very useful when you forget to set the thermostat to away mode or when you need to end the away mode earlier. The unit can also be connected to smart home platforms via Wink and Apple HomeKit. The Sensi makes adjusting the temperature in your home easy. Using the app you can change the temperature and create schedules from anywhere. People who are not tech-savvy will appreciate the app because it is user-friendly and it is very easy to figure out how to use it. The current temperature is in the middle of the screen, and right next to it are the up-and-down arrows that allow the user to change the temperature. In addition, the system’s status is displayed on the bottom and the weather report on the top of the screen. The current schedule is also displayed. The Sensi comes with nine built-in schedules which makes it easy to set up. Users can also create their own schedules and even separate the schedules for work days and weekends. What frightens many traditional thermostat users is the installation of a new smart thermostat. Luckily, the installation of Sensi is DIY-friendly and can be done by almost anyone. If you are still not confident installing it yourself, the Sensi website can help you find a professional who will can do it for you. Connecting the thermostat to your home’s Wi-Fi is a breeze. Some users have complained about the connectivity issues, but the issue seems to resolve by itself within a day or two. 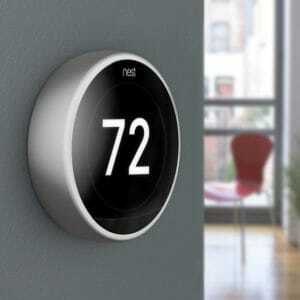 The Nest 2nd generation learning thermostat is very similar to its successor, the Nest 3rd gen thermostat. The main difference is that this one is about $50 cheaper and it lacks certain advanced features such as Farsight and hot-water controls. The most notable difference is the display. Nest 3rd gen thermostat has a 30% bigger display and 480 by 480 resolution, making it much easier to see information across the room. There’s a noticeable difference in the design between the two models. Still, the 2nd generation has a sleek and stylish design, and like the 3rd gen model it includes a built-in motion sensor. It glows red when heating and blue when cooling. 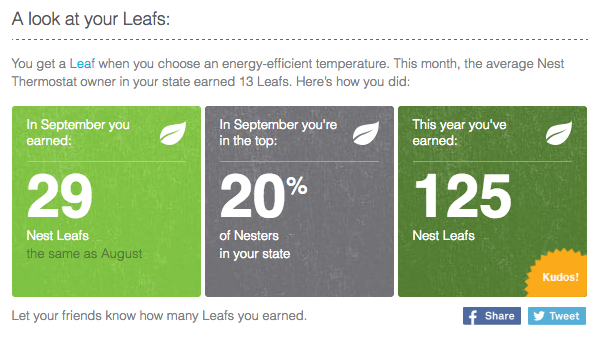 A little leaf will appear on the thermostat to notify the user that it is conserving energy. The 2nd generation model features many of the same energy saving features as the newer model. It learns when the user is usually at home, monitors the user’s desired temperatures, and just like Nest 3rd generation thermostat, makes all the changes on its own. One of the fun features of this thermostat is that whenever a person comes near, it will light up its screen so the user can see the temperature and adjust it as needed. However, this feature is slightly upgraded with Nest 3 and it is called Farsight. The Farsight feature allows the user to see the temperature from up to 20 feet away from the unit, whereas the Nest 2nd generation thermostat can detect a person only three feet away from the unit. Another feature that Nest 2 lacks is the Furnace Heads-Up feature. Furnace overheating is a common issue that the Nest 3rd gen can help prevent. Turning off the unit to prevent overheating increases home safety and it adds to the energy efficiency of the unit.This older unit from Nest lacks the Furnace Heads-Up and Safety Alerts feature which texts the user when there is something wrong with the HVAC system. Even though Nest 2nd gen thermostat lacks some smart features compared to Nest 3, it is still one of the best thermostats on the market. Its auto-away feature will definitely help you save a significant amount of energy (and money), “Early On” feature will make cold mornings more pleasant, and “True Radiant” mode will let you know how much heat exactly is being created. If the features like Safety Alerts, Furnace Heads-Up, and Farsight are important to you then the Nest 3rd generation thermostat is the better choice. If you want to buy your first smart thermostat and are willing to live without those features, the Nest 2nd generation is a much better bang for your buck. The Lux Geo thermostat is one of the thermostats that are very easy to install. Just like many other thermostats, you can use this one to set the target temperature in your home, create schedules, and access the thermostat remotely. This thermostat has also geofencing capabilities which can save you money whenever you are away from home. But, unfortunately, it lacks some advanced features such as remote sensors and support for smart-home systems. The Geo is budget-friendly but also DIY-friendly. It works with systems that have a C-wire, but can also run on batteries. This makes it compatible with almost every HVAC system. It also makes it easy to install. The Lux Geo thermostat has an app that is compatible with Android and iOS phones. You can use it to link the Geo Lux to your home network, set your heating/cooling preferences, and create schedules. The app is useful for the built-in geofencing feature. This feature allows the thermostat to detect your distance from your home and automatically switch to Home or Away mode. By doing this, you actually do not need to set any schedules or even to set the thermostat to vacation mode. The geofencing feature is extremely easy to set up. The app will show you a map around your place and you get to choose the desired radius for activating the Home/Away feature. The major drawbacks are the outdated design and the lack of smart home integrations. For many, this will be a worthwhile tradeoff. If you’re not interested in spending the money on our top picks and you don’t care about those missing features then you should consider the Lux Geo. The first thing we have to point out about the Honeywell RTH6580WF thermostat is its incredible price. It’s often for sale for less than $100, you can check the price on Amazon here. One of the reasons why this Honeywell thermostat is so cheap is it is an older model which looks like a traditional thermostat. But do not judge a book by its cover. The Honeywell RTH6580WF is the best value on the market. Just like all the other thermostats, this one can also be controlled remotely through the same Honeywell app that we discussed in the RTH9580WF model above. This thermostat is also compatible with Amazon Alexa, unlike the more expensive Lux Geo. What is impressive about this Honeywell thermostat is its 7-day programming feature. You can program up to four different periods per day seven days in advance. This means that you get to choose the temperature for every part of the day – morning, day, evening, and night. The thermostat will show its user the local weather report to help determine the temperatures according to the condition on the outside. The unit is pre-programmed for energy saving as well. 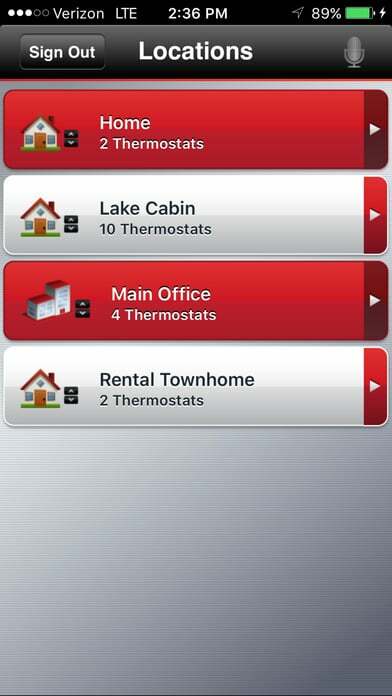 The free “Total Comfort Connect” app from Honeywell can be used to set up schedules, change the current schedule, and control the temperature remotely. If you have multiple thermostats installed you can control each of them through one app. 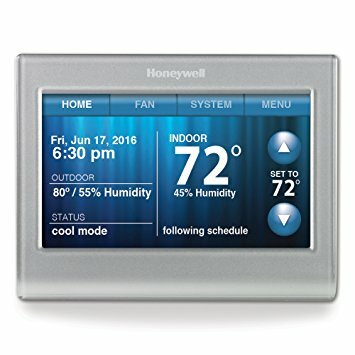 This makes the Honeywell RTH6580WF a great pick for customers with multiple thermostats in their home. The low price means you could replace every thermostat in your home without breaking the bank, and you can control them all from a single app. Do not let the design of the Honeywell RTH6580WF fool you. Even though it is not as modern as the Nest or Ecobee4, it does operate using advanced technology. It is a great choice for those looking to update their old thermostat and save on energy costs without too many fancy new features. If you’re interested in learning more about this powerful, budget friendly thermostat you can check out our deep dive review. Wi-fi and programmable thermostats can help you save energy and money. They will usually pay for themselves in a year or less. Energy usage reports can help you determine how much energy you’re using and how to cut back on energy costs. You will always be in control of the temperature in your home, regardless of your location. 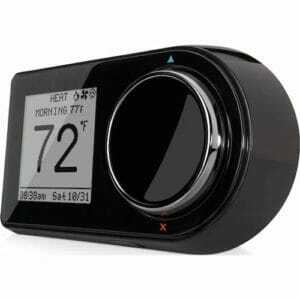 The new WiFi thermostats usually have a modern or even futuristic design that will look great in your home. The best choice for you depends on your heating and cooling needs and your budget. Don’t forget to take into account other factors such as the size of your home, installation, as well as wiring and compatibility with your HVAC system. To learn more about installing a thermostat we recommend reading about the C-wire and how that affects thermostat compatibility. Have questions about a thermostat? Don’t see your favorite thermostat here? Please drop us a comment!